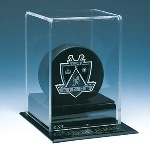 Single hockey puck acrylic display case with engraved logo. All NHL teams and official league logo are available. Also available with no logo. Price includes 1 free nameplate. If no nameplate is wanted, simply leave that field blank. 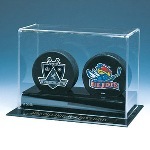 Double hockey puck acrylic display case with engraved logo. 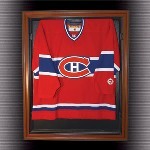 All NHL teams and official league logo are available. Also available with no logo. Price includes 2 free nameplates. If no nameplate is wanted, simply leave that field blank. 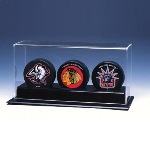 Triple hockey puck acrylic display case with engraved logo. All NHL teams and official league logo are available. Also available with no logo. Price includes 3 free nameplates. If no nameplate is wanted, simply leave that field blank. 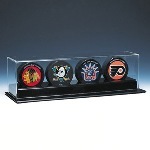 Quad 4 hockey puck acrylic display case with engraved logo. All NHL teams and official league logo are available. Also available with no logo. 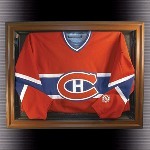 Price includes 4 free nameplates. If no nameplate is wanted, simply leave that field blank.